Since its establishment in 2015, Caiden Acupuncture and Herbal Clinic has been helping their patients through the practice of acupuncture. Acupuncture is an ancient Chinese medical tradition that uses needles to stimulate specific points on the body to help treat various diseases, reduce pain, and relief stress among other things. The company’s office, which is located in La Puente, California, aims to create a welcoming environment for their patients while also providing certified acupuncture treatment for their medical needs. Our client requested a website that was simple and straight forward, but also user friendly. 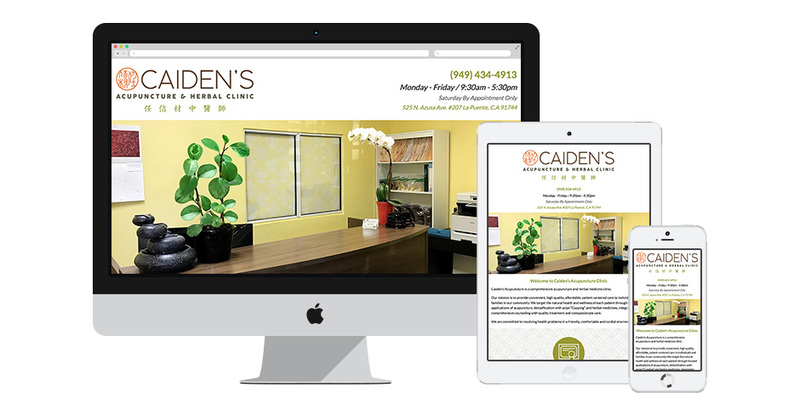 They emphasized their desire to have their website reflect the welcoming and at home type of atmosphere that their patients experience during their visit to the office. After a consultation with our client as well as a thorough industry research, our designers got to work on the design of the website. In keeping with the welcoming “at-home” feel that our client requested, our designers used warm tone colors in their designs. After the industry research, the team incorporated circle patterns to create a peaceful “zen” feel that is traditional in the practice of acupuncture. With the design in place, our dev team built a one-page responsive website for the client to keep it transparent and sufficient. The finished website contains all the business information our client needs with some added Spanish content for their Spanish customer base in their community. The overall look and feel of the website stayed clean as requested and the design of the website indicated the “at-home” feeling that our client aims to create with their business.